Shin splints are a common issue with runners, and they’re one of the most frustrating. Once they flare up, the rest of your run can be miserable. Each step can become excruciatingly painful. They make it very difficult for you to pick up your foot, especially your toes. They make just getting home a painful experience. Calming them down when they occur can be nearly impossible. You can spot treat them by stopping to stretch or massage the muscles, which may help temporarily, but normally does not keep shin splints away for the rest of the run. How do I know all this? Because I have been there myself many times. Rather than talking about shin splints after they’ve already popped up, let’s look at the causes, before those nasty symptoms even start. It’s also worthwhile to clarify what shin splints are — they come from tightness in the muscles on the front of the lower leg. 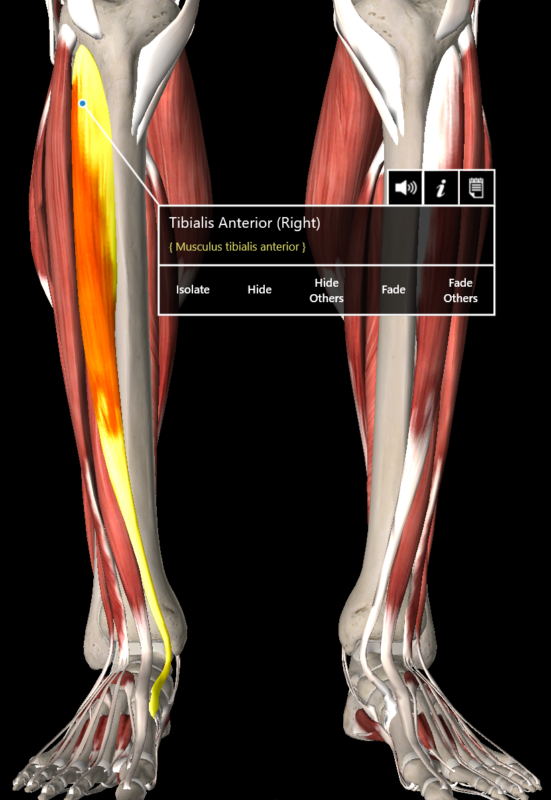 Typically, it’s from the anterior tibialis, but a couple other muscles can be involved as well. Like any running-related injury, a number of factors contribute to shin splints: not enough ankle mobility, tightness in the calf muscles, weakness in the feet, and running technique faults. We’ll explore all four of those factors here! Our ankles require a certain amount of motion for normal function. If that motion is limited for any reason, the muscles around the area are required to work harder in order to get the ankle to move. When just walking, this is not a big deal, as it is fairly effortless. When we begin to run, our movement is amplified, requiring the muscles work harder to move the ankle. Long term, this fatigues the muscles, resulting in increased tightness and pain. You may be asking why the front of the lower leg is more affected than the back of the lower leg. The answer is simple: the muscles on the front are much smaller compared to the calf muscles on the back of the lower leg. The smaller the muscle, the harder they have to work to perform the motion. Calf muscles can tighten up for several reasons. One is footwear. Most shoes, no matter their purpose, have slightly elevated heels. The more shoes are worn, the more the calf muscles get used to being in a shortened position — that’s partly why we’re better off cross-training in the gym using lower drop shoes. But, an increasingly common cause of tight calf muscles is one most of us can relate to a little too much — sitting. Without realizing it, we hold our toes slightly pointed when we sit, which can shorten up those calf muscles. Just another reason to take frequent standing or walking (or running!) breaks! Both of these can contribute to tightness in the deeper calf muscles. When the calf is tight, the muscles on the front of the leg must work harder to overcome that tightness to allow the front of the foot to be raise up properly, especially on the run. Harder work over many miles stresses those muscles out too much, leading to shin splints. When the foot is weak, the arch collapses with each step. Again, when walking this is not as much of an issue, but when we put more force through the leg and foot on the run, the issue is magnified. This collapse causes increased torque and force through the muscles and tendons as the foot rotates inward. Then, more force is required to push the foot off the ground, once again over-stressing those smaller muscles in the front of the leg. Running technique is a contributor to many running-related injuries, of which shin splints is just one. Overstriding and heel striking require us to pull the toe up harder and longer against gravity — you can usually work on this by shortening up your stride. Additionally, if we use the hip flexors to bring up the knee rather than the relying on the strength of the hamstrings, we end up activating the anterior tibialis to pull the foot up at the same time, once again causing too much stress. If you experience shin splints, I am sure you are wondering which of these issues is the cause of your pain. My guess is all of them unless you have taken time to address one or more of these issues already. Spend time addressing the tightness and stiffness around your ankle and calf. Take time daily to strengthen the small muscles in your feet — just incorporating a few foot strengthening exercises in your weekly routine can make a world of difference. And for faults in your running technique, consider getting a gait analysis from us at Fitted — send us a video of you running, and we can evaluate your form in addition to recommending running shoes. Address these root causes with consistency, and before you know it, your shin splints with be a thing of the past! This entry was posted in Wellness and tagged injury prevention, injury recovery, running-related injuries, shin splints.